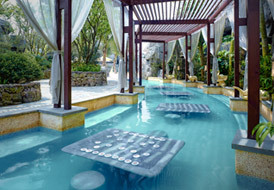 Here gathered the characteristic Tai Chi Springs, Hot Stone bath, Chinese Empress Pool and major Chinese medical herbs springs. This is a soothing zone for both of your mental and physical health which filled with Chinese health concepts of Yin and Yang and the five elements. 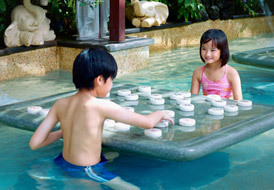 In addition, kids can also have fun in the games pool and bubble springs. Ginseng is known as “king of herb”. It can regulate the nerve system, enhance memory, calm, improve cardiac function, decrease blood glucose level, strengthen the body immunity and for beauty purposes. 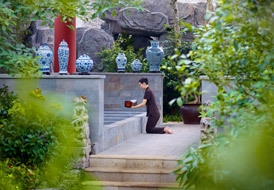 With hot spring water flowing under the stone plate, you can lay yourself comfortably and feel the warm energy that boosts blood circulation. Bubbles with different sizes combined water current helps to massage your body and promote blood circulation.